We had an interesting Sunday School lesson recently. The instructor asked us to read the hymn I Know That My Redeemer Lives (p136 in the hymnal) and share the lines that mean so much to us. Like you, I love this song, which has a history of influence in all our lives. The class members shared messages of hope, appreciation, loyalty, and love. Gratitude for the Savior and his important mission was apparent, and through tears many expressed their sentiments for a song and lyrics which have literally changed lives. This was just the beginning of a beautiful lesson filled with the Spirit as the sister instructor and class members shared testimonies of the influence of the Savior Jesus Christ in their lives. I thought of my own feelings toward this song and its message. Each line describes personal and evidentiary ways the Lord influences our lives every day. “Friends may betray us, spouses may leave us, health may fail, and our possessions burn up. But Christ, His promises, understanding, and love will never fail us. With some trials and most tragedies, only this can get us through. When we can take a thankless, demanding calling; give up something we wanted greatly, so we can pay our tithing; or help out someone who has badly hurt us and say ‘I wouldn’t do that for anyone, except I’ll do it for Christ!’ then the power for good he can have in our lives is becoming a reality. He must be the foundation of our lives. “I think about the great sacrifices my parents and forbearers made for me, and the fine example they set of complete faithfulness to the Savior and His teachings in their lives. Now it’s my turn. I would surely feel amiss to pass on to my posterity something less. I will stand as a witness that Christ is divine, has risen from the dead, and out of his love for us has overcome every barrier to our return to Heavenly Father and enjoyment of the unspeakable joys of eternal life. I know that His teachings are the only way to happiness and peace in this life, for individuals and nations, and to joy in the world to come. All I do and say is in the hope that I might help His cause and help others come to Him for the right guidance in life and the strength to do what’s right. Even now as I read those words, my heart swells with appreciation and love for my father and the blessed opportunity I had to be taught at his knee. He and my mother are one in their teachings, influence, and desire to help, bless, and lift their children, grandchildren, and others. Now that he is waiting for us on the other side of the veil, I am encouraged to live my life every day so that I can take advantage of the blessings he so beautifully articulates, which are all made possible by the Savior Jesus Christ. He is the Son of God, the Prince of Peace, and our Advocate with the Father. Truly, though Jesus Christ all our fondest dreams will be realized in his time. 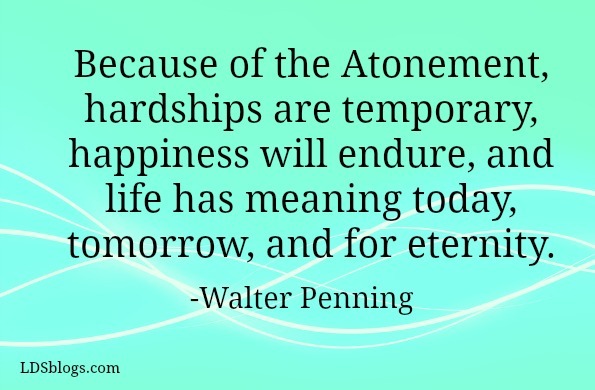 Because of the Atonement, hardships are temporary, happiness will endure, and life has meaning today, tomorrow, and for eternity. What joy this sentence gives: I know that my Redeemer lives.